Dissent in the ranks of the faithful! After my clock loss at Gladiator Games, I'm trying to get more reps with Thyra. This particular build is a little bit hard to pilot, having a lot of options on any given turn and a lot of janky movement and activations that can easily get gummed up on each other. My opponent brought as much Feora3 pew pew as he could muster. Our scenario was Standoff. You can find Jaden's write up on this scenario here: SR 2017 Scenario Guide 2: Standoff. My opponent won the starting roll and opted to go first, given that that puts his guns up in my face very quickly. I chose Fuel Cache as my objective, my opponent chose Stockpile. From my perspective, he had a hill to my left, a central wall most of the way into his zone, and some rubble to my right. He deployed the Zealots on the left side by the hill, with Hand of Judgement and the Vanquisher placed centrally. his Deliverers and Sunburst crew were to my right, and Feora stood behind her 'jacks in the center. All the support set up behind those lines. His Idrians Advance Deployed centrally, and the Allegiants set up on my right. So I've got a wall way out to the left in the circular zone, a forest more or less central but a bit left, a decent trench right in front of me in my zone (which is a lot of why I picked this side), a hill to the right of that, and a forest off to the right. I deployed my Temple Flameguard on either side of the army, the 'jacks and Thyra in the center, and the Flame Bringers in a line behind them. Nicia deployed near the forest, ready to go abuse the Fuel Cache objective as much as possible, and my Wrack was a little behind my trench. Pyyrhus set up with the Flameguard on the left, since I got the feeling a lot of this fight was taking place in the right side zone and I wanted just a bit more oomph (and access to relentless charge) on the left to make sure I didn't have any issues with that zone. The Idrians choose the Dervish as their prey. Honestly, everything just ran this turn. Nothing was really cast, choir didn't really do anything, picture pretty much explains what happened here. I know, it's lazy, but seriously... it all just ran. Well, I'm gonna get shot at, but I should be able to mitigate the damage somewhat. My 'jacks all get Passage and then run, mostly leaning towards the right where I think most of this battle is going to take place. I mis-place some things around Blood of Martyrs and gets a little stuck, losing a couple inches of threat, but is no big deal. 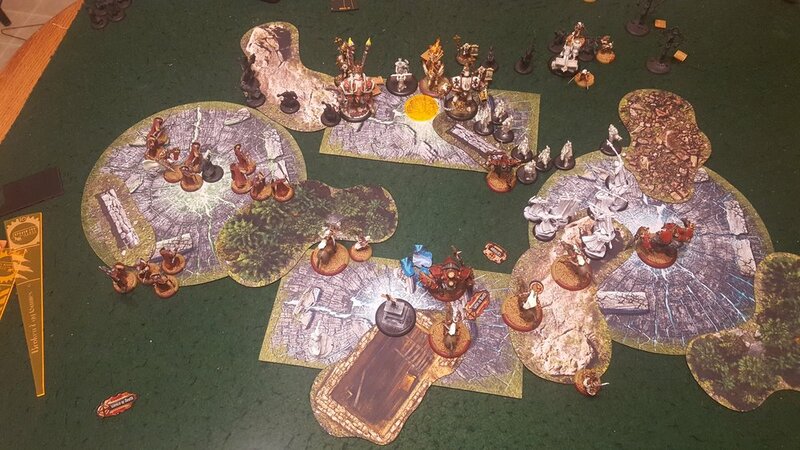 Thyra gets Silence of Death onto the Flameguard on the left to go fight the Zealots, Occultation on the ones on the right to avoid CRAs and force the Idrians closer if they want to fight, and Gates of Death on herself. I pull a focus off the Wrack just in case of a nasty deviation or something wrecking Thyra's day (a full ten man CRA from Deliverers is a POW 15 blast, and the Sunburst could easily hit her and light her on fire as well, I figure a little extra protection is good.) Of course, the wrack explodes. She walks up into the trench. The Flameguard run out on either side, setting up in pods of 3 and keeping out of the Zealots threat range on the left. Right side they get pretty far up. Nicia had received Pathfinder from the objective, so she charges one of the further forward Idrians, getting two in range. She nails every attack, killing two Idrians and shooting a third dead before sprinting back into a nook behind the forest, within 4" of my objective. The Flame Bringers spread out way in my backfield to be a late game threat, and Pyyrhus goes and sets up with the TFG on the left. Nicia's position here is just silly. It sort of dawns on my opponent how rough that left side is going to be, but I killed the Idrians I did partly because they were in range but also because it reduces the number close to that zone, cutting reinforcements off. His two options are either dedicate much more to the left to not lose it instantly, or push harder on the right to try and win that side faster. He goes with option B; the only things that can go to that left side really are his heavies, and I've got my two heavies screaming up the right. Once he has stuff on the left, it's mostly stuck there due to the forest. The Idrians move forward into stealth range of my TFG on the right and put some shots into them, but between needing 8's to hit (10's on the hill sometimes), and tough they only kill one. He fires a Sunburst shot into a couple, and the deviation stays on them and kills both. The Deliverers pump a huge CRA into one of my Flame Bringers who foolishly stood in the center of my Choir, wiping out the Flame Bringer and every single choir member. The 'jacks and Feora stay pretty far back, avoiding my Sanctifier's threat (who is now full on souls), and Hand of Judgement gets Redline. One allegiant walks up and kills one TFG (he misses the second), the other toes the very back of the zone and pops Shifting Sands Stance. His Zealots spread out in the zone and threw some bombs at TFG, but were out of range and the deviations didn't help much. TFG just mitigate losses so much and it's glorious. I will certainly miss my choir though, but I should have positioned better. That said, if Deliverers want to kill your support, they're gonna kill your support. Alright, we've got work to do. The Daughters ambush on the right, waaay out near my opponent's deployment. I drop Occultation but upkeep Silence and Gates. There's not a lot of nuance to this turn; I just want to kill everything in my range. The objective gives Nicia pathfinder again. Thyra activates first and charges, casting Carnage and using Overtake to kill two Idrians. Nicia charges across to the right, killing two more Idrians (including the Guide) and I believe missing her gun shot into a third, then sprinting back behind her forest. Blood of Martyrs, having Apparitioned out of his nook and getting allocated a focus, walks up and trivially kills the Allegiant and a few more Idrians. The Flameguard charge, killing the remaining Idrians and a couple Deliverers, engaging one more. The Flameguard on the left charge and kill all but one Zealot in the zone (somehow in my charges I just... didn't notice I hadn't charged him.) Pyyrhus (still not really paying attention to the one Zealot) runs to get touch a couple TFG. Silence of Death RFPs them all so I don't have to worry about the minifeat. Both Flameguard units also popped Iron Zeal to get a bit of resistance to blast damage. The Daughters just run, thoroughly engaging the Sunburst crew, a few spreading out in the back to threaten support. The Dervish runs to touch the enemy zone and engage two Deliverers. The Flame Bringers spread out to be threatening next turn. I pass the turn, scoring one point in my zone and teleporting Thyra with Gates back out of Feora's threat range. Can't stop the flame train! Choo choo! He's got a lot of work to do, but at least my stuff is pretty packed together. I've also got my Sanctifier easily in Hand's threat range, because I figured that trade is fine if he wants to go that route. He upkeeps Redline and loads up the Vanquisher. Feora feats and goes into the Dervish, killing it pretty easily, then using Fire Step and Reposition to bounce back into safety. The Vanquisher charges a TFG on the right, using Thresher to kill a bunch of them (some toughed and, even under Incite, he did miss a few.) His Zealots aimed and throw fire bombs at the TFG on the left, getting a crit on the first and setting a couple on fire and killing one, although he also kills his own Zealot in the zone. He only kills one other TFG with the fire bombs. His Choir activates and gets Battle onto Hand, one of them toeing the zone on the left. The Vassal then Empowers him and he charges the Sanctifier. Even with only two focus, he kills it pretty easily, setting a Flame Bringer on fire with Flame Burst. A few Deliverers do die to free strikes, and the remainder fire an AOE into some TFG but fail to kill any. His arms master throws a fire bomb at one of the Sunburst crew members, killing two Daughters and both his crew members. The Book runs around to make sure BoM can't get a charge into Feora if I kill the Vanquisher. He passes the turn, scoring his zone. I don't score mine since I have no 'jacks back there. Score is 1-1. The Vanquisher... must be Vanquished! Vengeance triggers on the Daughters, which clears the Sunburst out and does 1 point to the Arms Master. Both fires on the Temple Flameguard go out and the Flame Bringer takes no damage from her fire. I upkeep Gates, but drop Silence since RFP is no longer necessary over there. Blood of Martyrs gets to full focus. Nicia gets Pathfinder from the objective and walks through the forest, killing a Zealot and the Choir member in the zone, then sprinting back to engage his Choir leader and toe his zone. The Temple Flameguard on the left shield wall and advance, killing the remaining Zealots. Pyyrhus has to finish off the Monolith (taking his second attack to do it, too) since the TFG there got a snake eyes attack roll. I have finally cleared the left side of the table. Thyra charges Hand of Judgement and casts Silence of Death onto the Flame Bringers. She puts a couple good swings into him and does good damage, then feats to jump back two inches. The Flame Bringers charge, one going into the Vanquisher, and finish off Hand of Judgement. The one into the Vanquisher doesn't do as much as I'd like, but ah well. Blood of Martyrs, with Hand of Vengeance active, boosts an attack into the Allegiant in the zone and kills him, then puts his remaining attacks into the Vanquisher, dodging all of his systems and basically leaving him fully functional, though pretty badly damaged. The Temple Flameguard use the feat to bounce back a bit and then charge, but don't do great with their damage rolls. The Vanquisher is left alive with all systems functioning. The Daughters charge, killing all but the choir member Nicia is engaging and a couple Deliverers. Thyra teleports back, out of my zone, to avoid Feora's threat range, so I don't score my zone but I do score the left side and he scores none due to Nicia. Score is now 2-1. He's in a rough spot, but he can do some damage. Feora pulls off a Wrack and casts Incite, moving up a little and spraying over her Book and Blood of Martyrs. The Book is lit on fire and takes a point of damage, and she takes a decent chunk out of my heavy, lighting him on fire as well. The Vanquisher activates, full on focus, and does another Thresher. Hit rolls go a bit more his way, killing most of my remaining Flameguard in that zone. He hits Blood with the attack and buys more into him, leaving him low but still with movement, a cortex, and one arm. Unfortunately he's also about a mile out of my control range. The remaining couple of Deliverers turn around and kill a couple Daughters, and a Mechanik, who he had forgotten to deploy and put on the back edge of the board in the first round and then forgotten to activate a couple times, charges one in the back and kills her too. The engaged Choir member with Nicia flails his stick at her but doesn't do anything. He ends his turn and I score the left zone, making the score 3-1 in my favor. One lone TFG member holds the line on the right! At this point Scenario is a pretty easy victory. I upkeep Gates and Silence of Death. Blood of Martyrs, with Hand of Vengeance, finishes off the Vanquisher with his initials (the broken arm did the final couple of points). The Flame Bringers charge, two getting onto the objective and the rest going into the Book. The two on the objective kill it, the ones on the book kill it and one Deliverer, and they all reposition into a circle around Feora. At this point I score one from the objective, so 4-1, then one on each circular zone, making the score 6-1 and ending the game. The Daughters of the Flame take their former commander into captivity. Maybe with Feora out of the way, it's time for Thyra2, Commander of the Flameguard? I'm trying to just get more games with this list since it was the one I had the hardest time activating efficiently at the event the other day. Its sheer volume of options on a turn by turn basis astound me, and it feels like it has every tool it could want, though definitely can have some problems at the extreme level of armor crack. You'll notice I never mentioned Eilish this whole game; he did activate every turn and basically just threw Puppet Master onto random models because he just didn't have anything else to do. He's there very specifically for the Cryx matchup, as well as a few others... but if that matchup for whatever reason is less of a concern, he'll be swapped for Anastasia di Bray. He's not bad, just not super useful in this particular matchup. As soon as I run into someone with Crippling Grasp or Rebuke or something though, I'll be very happy he's around. I'm getting better at using Flame Bringers as well; as a late game cleanup crew/secondary punch they're so strong and can just play a cagey positioning game for so long before having to go in. Overall I'm loving this list build and can't wait to keep taking it to events!